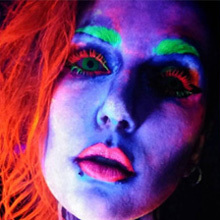 Perfect for wild parties and crazy events in UV light, freaky and green, your eyes will seem to shine like cat's. ColourVue Glow Green contact lenses are a step further from Hulk contacts - not only are they bright green and look fantastic in daylight, but also, under UV light they give an amazing green glare that will draw everybody's attention. If you want to amaze your friends, wear these glowing green contacts! In daylight these lenses have a grass-green colour, but under UV light, they glow with very bright green tint! Try them out now!